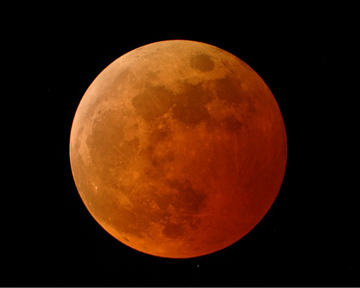 The Moon often remains visible during a lunar eclipse, because the Earth's atmosphere bends sunlight passing through it. The light bent by the atmosphere is directed into the Earth's shadow, and thus lights the Moon. Dust in the air reddens this light (as it does in sunsets). A scale devised by Andre Danjon (1890–1967) is used by observers of lunar eclipses to describe how bright the eclipsed Moon is. 0 Very dark eclipse, Moon almost invisible. 1 Dark eclipse. Gray or brownish coloration. 2 Deep red or rust-colored eclipse. but outer edge of umbra is brighter. has a bright or yellow rim. 4 Very bright copper-red or orange eclipse. Umbral shadow has bluish, very bright rim.